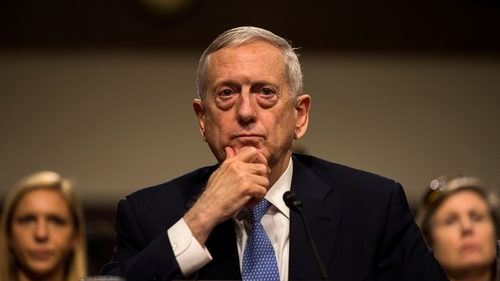 US Defence Secretary James Mattis called China and Russia "revisionist powers" that "seek to create a world consistent with their authoritarian models"
Russia and China have condemned a new US defence strategy which puts the competing powers of the two countries, and not terrorism, as the main priority of its national security strategy. The US military has put countering China and Russia at the centre of the new strategy, the latest sign of shifting priorities after more than a decade and a half of focusing on the fight against Islamist militants. In presenting the new strategy, which will set priorities for the Pentagon for years to come, Defence Secretary James Mattis called China and Russia "revisionist powers" that "seek to create a world consistent with their authoritarian models." The "National Defence Strategy" represents the latest sign of a hardening resolve by President Donald Trump's administration to address challenges from Russia and China, at the same time he is pushing for improved ties with Moscow and Beijing to rein in a nuclear North Korea. "We will continue to prosecute the campaign against terrorists that we are engaged in today, but great power competition, not terrorism, is now the primary focus of US national security," Mr Mattis said in a speech presenting the strategy document, the first of its kind since at least 2014. "It is regrettable that instead of having a normal dialogue, instead of using the basis of international law, the US is striving to prove their leadership through such confrontational strategies and concepts," he said. "We're open for dialogue, we're prepared to discuss military doctrines," he added. China's US embassy criticised the strategy, saying Beijing sought "global partnership, not global dominance." "If some people look at the world through a cold war, zero-sum game mindset, then they are destined to see only conflict and confrontation," an embassy spokesman said in a statement. The document also listed North Korea among the Pentagon's priorities, citing the need to focus US missile defences against the threat from Pyongyang, which beyond its nuclear weapons has also amassed an arsenal of biological, chemical and conventional arms. The document said that international alliances would be critical for the US military, by far the world's best-resourced. But it also stressed a need for burden-sharing, an apparent nod to Mr Trump's public criticism of allies who he says unfairly take advantage of US security guarantees. Mr Trump has called the NATO alliance "obsolete", but Mr Mattis said the United States would strengthen its traditional alliances while building new partnerships and listening more to other nations' ideas. "We will be willing to be persuaded by them, recognizing that not all good ideas come from the country with the most aircraft carriers," Mr Mattis said. The Pentagon is also working on a policy document on the country's nuclear arsenal. While Mr Mattis did not specifically address that review, he said the priority is deterrence. "How do we maintain a safe and effective nuclear deterrence so those weapons are never used? It is a nuclear deterrent, it is not a war fighting capability unless it is the worst day in our nation or the world's history," he said.